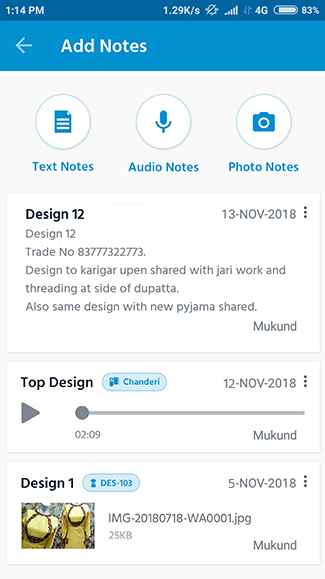 Manage your designs and share with customers with price via Whatsapp. 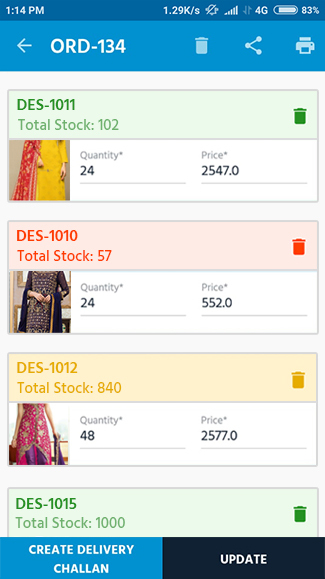 Take sales orders by keeping tab on current design inventory on the go. Maintain your purchase records with pictures and track supplier-wise purchases. Create digital job slips once and auto-generate all other important reports. 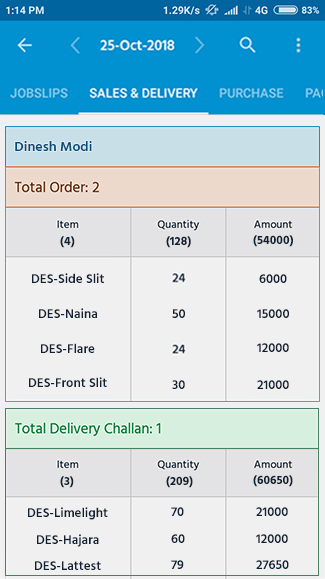 Create packing slips, sales order-wise dispatches. Never forget anything; Add text, audio, and photo notes and share. Know karigar-wise current stock of designs and raw materials. 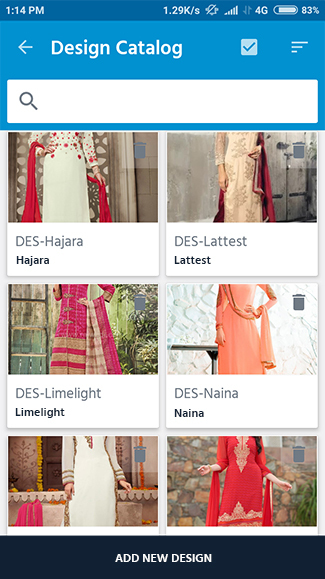 Know current stock of designs and raw materials from anywhere. Know production status for each of your orders. Daily updates on total production, sales, packing, and purchases. 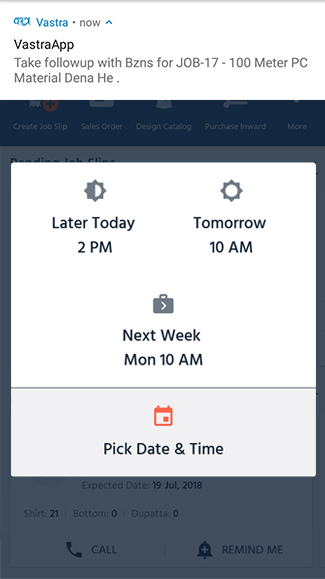 Add reminders for payment, production, collection, purchase, and more. Save at least 2 hours a day by maintaining job records and karigar follow-ups. Know your raw material stock at any time and avoid over-ordering. Know production pipeline and avoid over-producing. Know your sales orders and handle sales team effectively. Know your Design stock while accepting sales order and delivery challans. Know your Production, Karigar-wise and Design-wise stock on a single tap. 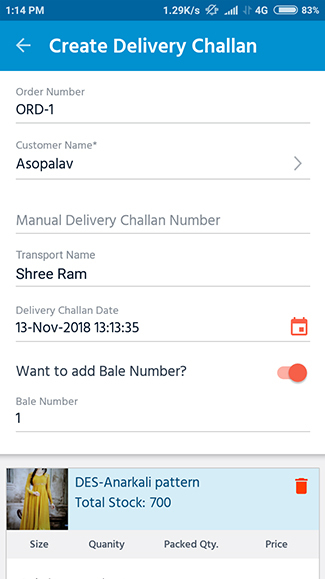 Plan your deliveries in a smarter way. Manage tasks effectively with intelligent reminders. Manage your business effectively from anywhere. Grow your business with intelligent insights and efficient management. Not at all. Your existing staff can start using it in minutes as it is as easy as using Whatsapp. We use industry standard encryption to secure your data. You and only you can access it. You can also control the access of your staff. The app will help you print from any wifi enabled printer or any printer connected to the Internet. Suppose Prakash is your Production manager. Prakash is used to issue paper-based jobslips to multiple karigars on regular basis. Now once the karigar returns goods, Prakash will make an entry in the receipt book and add receive entry into the slip. 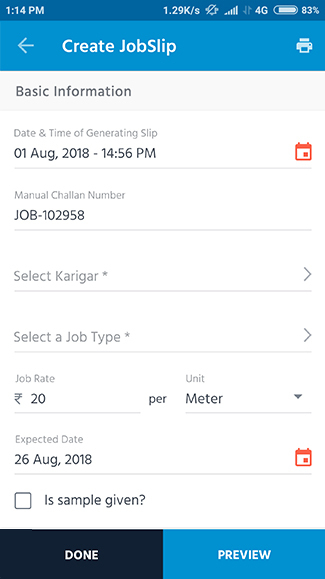 With Vastra App, Prakash creates Jobslips directly in the app, takes 2 printouts and gives one copy to respective karigar and the other he files. Now while receiving the goods, he will just open the app and receive the goods. That’s it. No additional work! Same as Prakash, the Sales manager, Packing Manager, Purchase Inward person, all of them can do their jobs far better on the Vastra App. 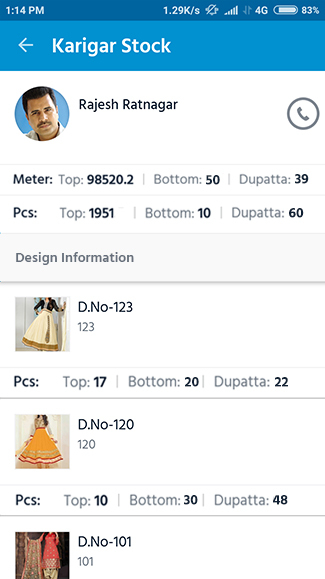 After using vastra app, now i don't have to call my production manager every now and then to ask him about the status of any particular design. I do not get stuck when he is absent for few days. 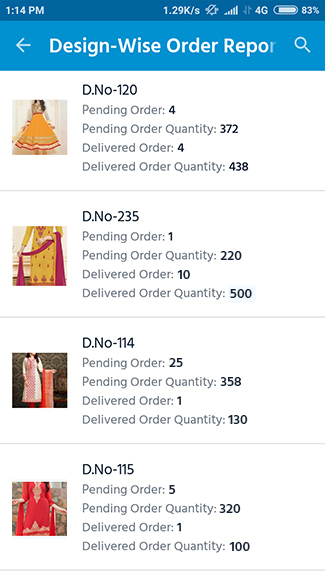 Earlier while taking follow up with karigars some of the designs may be missed out, but now with the use of vastra app none of the design get skiped. One of the biggest benefit is, as we get to know about the pending job slips in time, dead stock of unsorted or defective goods has been reduced to a great extend. Perfect in stock management, Easy to manage different works in shop, Whole business in one hand, Easy to give program to karigars, Making easy dispatching works. 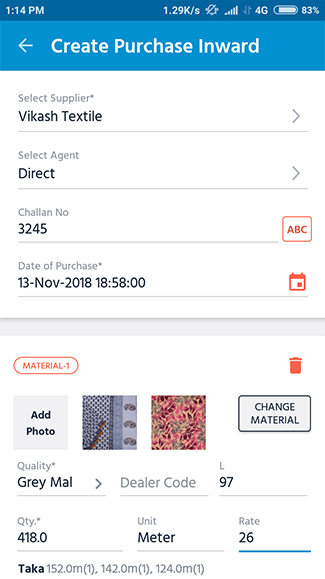 Vastra App is really making made easy by Automatically Report creation in place of manual work. It is easy to Use for everyone.It is very helpful for see the working of business at any place & anytime without asking any staff member.It is save our time so we can give more time to our regular important activity.It is very affordable to anyone by costwise. After using this App my whole working style changed. 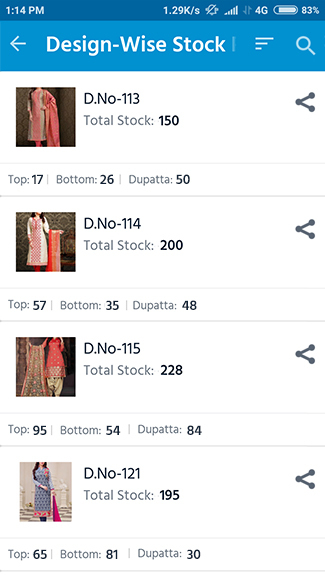 Vastra App is a much needed solution for apparel manufacturers, specially for those who partly outsource their production. 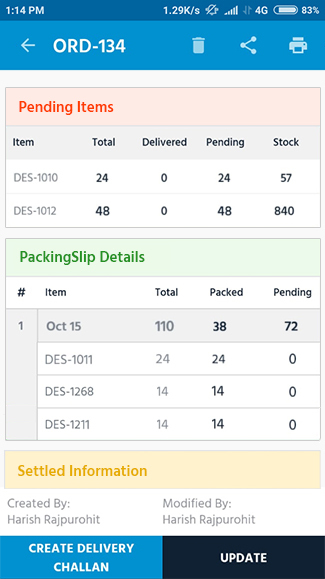 It is simple, easy and yet well equipped app to monitor your sourcing, inventory, orders and production process. For any software solution, support is most important factor and team at VastraApp gets 100/100 on that account. They're prompt to respond to queries and enthusiastic about suggestions. Excellent app for making garment manufacturing units. The support team is beyond expectations, till date never experienced this much supportive team. Hats off for all VASTRA team. You can try VastraApp for a Month in a cost less than your monthly tea expense. You can get VastraApp for a Year in a cost less than your annual books printing cost. © VastraApp A DIGICORP Venture.